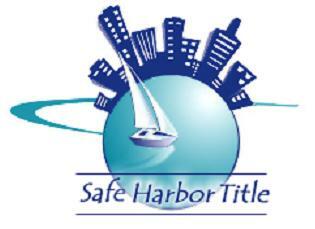 Safe Harbor Title is a Title Company geared toward customer convenience and client satisfaction. In a market moving so quickly every moment counts. Safe Harbor Title takes the worry out of your hands with 24-72 hour turnaround and a quick and easy closing process. Safe Harbor Title is your trusted partner for all of your Real Estate Closing needs. Buying or Selling your home? Safe Harbor Title will work with you to make your closing experience as smooth as possible. Safe Harbor Title has the necessary experience to meet or exceed the compliance guidelines that are required of lenders. Safe Harbor Title is a young upbeat Company willing to work around the 9 to 5 mentality and promises success on even the most difficult files. Safe Harbor Title cares about its clients and it is our priority to help the realtors and brokers involved close their files in a timely and expedient manner. Your files are never safer than at Safe Harbor Title Company. Come visit us at our new location today!